How do you shatter glass income ceilings? How do you reach the salary you’ve always dreamed of? How do you break through to the next level? And I’m glad you’re asking those questions. I hope you’re determined to find the answers. I love to strategize growth in every major pillar of life: relational, physical, mental, spiritual, and of course, financial. In fact, I’ve been on an empowering money journey of my own. In the early stages of my adult life, my husband and I scraped by on what’s considered poverty level in the United States. Just after we started adding children to our family, we hit our rock bottom. We went on to find stability, and later some comfort in our personal finances. I’ve gone from a stay-at-home mom to a top-earning Etsy seller, and I currently operate one of the top 8% highest earning, most profitable websites on the Internet (you are here). 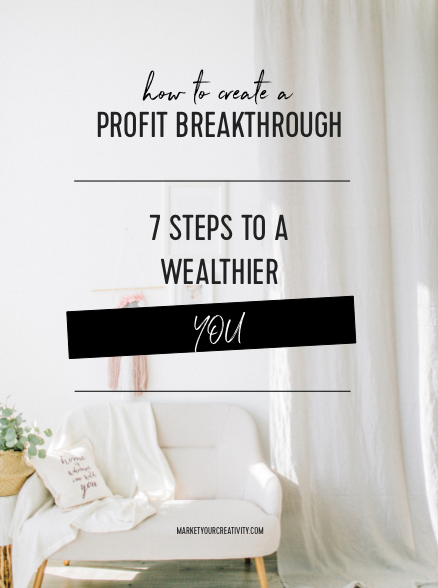 I’m teaching these 7 Steps to Profit Breakthrough to bring an awareness to what you’re telling yourself about money and your ability to earn it. It’s not always about doing more to earn more money—that’s a mistake I made myself last year. In fact, and as you’ll learn here, sometimes that approach backfires. Instead, I’ll ask you to clear out the clutter created by overdoing it. 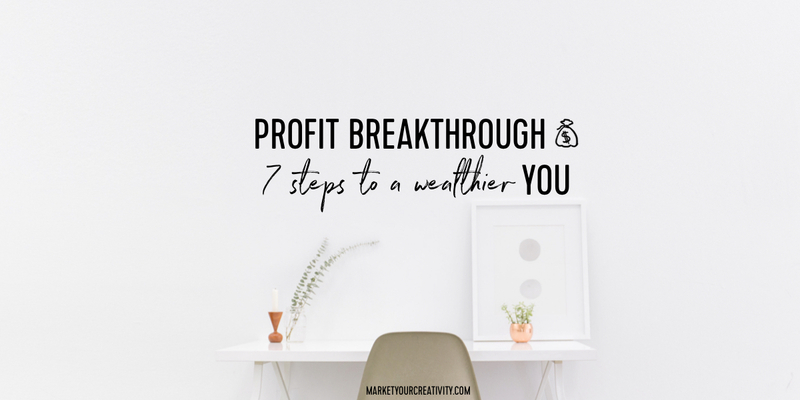 Without further ado, here are your 7 steps to Profit Breakthrough. Play the video below (25 minutes), or read the transcript for summarizing points. All recommended resources are linked at the bottom. Enjoy! First, let’s take inventory of your physical space, specifically your workspace for now. Look at your workspace, wherever that’s set up—whether it’s a designated office, a corner of a room, or a section of your basement. What’s on your desk? Are there stacks of paper and unfinished business? Is there dust and coffee marks everywhere? Are there little post-it notes, un-filed and ignored? Is it cluttered? Are there things needing put away? Do you have a lot to file? Is there mail stacked up, unopened? Are there a ton of small actions there that you need to take? When you’re sitting at your desk, what do you see? What do you look out at? Are there cluttered bookshelves, stuffed drawers, stacked and messy supplies? Are you hoarding supplies? If that’s the case, it’s time to purge. Look at your digital environment: Delete your texts, delete your voicemails, clean out your email, and unsubscribe to newsletters that aren’t feeling good. I used to be subscribed to a businesswoman whom I loved. She was a successful, fast-talking, number-crunching high-earner. However, her emails always left me feeling anxious that I wasn’t doing enough. If the emails are good, but they leave you feeling bad, that’s not a good email to be subscribed to. Every little thing left undone in your physical space is a mini-obligation that drains you of precious creative energy. While you’re doing the KonMari Method, another question to ask yourself is, “Does this represent the successful, financially wealthy person I want to become?” If it does, keep it. Donate, remove, or trash whatever’s left. If you tell a woman that she can substantially increase her income, odds are that she’ll get excited about the possibility, but not enough to change her mindset and step outside her comfort zone. I’m going to ask you right here and right now to raise your standards about what you want to earn, how much you think you deserve as a salary, how much you’re willing to learn and improve, and how far out of your comfort zone you’re willing to go. If you’re currently drowning in debt, you must first conquer that minefield. I encourage you to check out Dave Ramsey’s Seven Baby Steps for Financial Recovery, so you’ll know exactly what to work on next. It’s critical because you cannot achieve greatness if you’re struggling to make ends meet. You must first become a good steward of your money, and learn how to treat it with respect, before you can create a Profit Breakthrough. The foundation of your financial house must be solid in order to build wealth. It is time to ditch the have-tos and embrace the must-dos! This step enables you to protect your creative space. It eliminates unnecessary have-tos, and we all know what those are: “I have to blog, I have to post on Instagram, I have to pin 18 pins today. I have to …, I have to …., I have to …” We have a million have-tos looming on our to-do list. Instead, I urge you to brainstorm your must-dos. Those dreams on your heart, those true callings, your purpose—whatever you want to call it, the must-dos need to be birthed. I must travel. In traveling I’ll get to see more, I’ll get to experience more, and I’ll get to connect with more people. I must write articles that express how I truly feel about powerful women doing business. I have nothing but love and admiration for women who are out there getting it done and making tons of money, achieving results, and helping millions of others at the same time. I must build a course that shows people how to become an industry influencer, thereby attracting new business like a giant success beacon. Before you can honor your must-dos, you have to be okay with ditching the have-tos. Have-tos have to wait. It’s the same concept as above: You can’t live in debt and create prosperity. You can’t live in scarcity and create abundance. You can’t drown in never-ending have-tos and honor prosperous, life-giving must-dos at the same time. You must give up falsities to attend to the truth. What do you think you’re able to earn? What do you think you deserve to earn? While manifestation has a New Age vibe to it, to manifest simply means to demonstrate. It means to bring something into physical reality, through your own actions, beliefs, and ideas. Every time you create something out of nothing, which you do all the time, every time you bring an idea to fruition, which you do all the time, you manifest your dreams, you manifest your ideas, you make things come true. Therefore, if manifest means to demonstrate and create a reality, what are you demonstrating and creating each day with your money? Trust me, it’s easy to freak out about money! Every summer I get panicked, the business slows, the Internet is not that active anymore, and I lose my way. From Claim Your Power, anytime you think your problems are big and you are small, you’re playing the role of a disempowered victim. And, oh boy, do we become disempowered victims when it comes to money! Recently, a woman emailed me that financial success—specifically the way that I demonstrate and discuss it on my blog and in my books—simply was impossible for her. She shared her circumstances and daily obstacles in explanation. I gave this letter much consideration. In fact, it’s still in my inbox. She was basically telling me my methods don’t work for her. And I wondered if I should address her concern publicly. Should I do a sidebar for all those people who feel stuck, cemented in their current financial circumstances? She believes financial abundance is not available to her. How can money show up for a person who’s already decided that they don’t, can’t, and won’t have it? I understood her situation, and I truly feel for her. She wants better, I know, and she has also decided that she can’t have it. She makes several choices a day that guarantee she keeps scarcity her reality. In order for any of this to work, you must be open to possibility. Money is everywhere. They print more every day, and it’s available to you. Moreover, earning it doesn’t have to be so hard. In order to demonstrate bigger thinking, you must take calculated risks without fear. Possibilities and opportunities can’t open up to you while you play small, doing all the same things. Stop doing tasks that can be easily outsourced. Stop bending over backwards and over-communicating with high maintenance customers who aren’t adding much to your profit margin, but definitely drain the most energy from your day. Stop checking your inbox incessantly. You don’t have to read every single comment and caption on Instagram, just enjoy the ones that you catch when you happen to log in, and log in infrequently. The high-rollers in your industry invest their money and time wisely, and you have to act like one of the best before you can become it. Put it this way, you have to play like a major leaguer while you’re still in the minor leagues. There’s no other path to the major leagues than already playing as though you’re good enough to make the team. Life opens up when you play a bigger game. To play bigger, you must accept that greatness is already yours and step into that role; you can do it right now. You can do it today. It’s not a thing that you have to gradually learn and become. I love this one; test driving works. When you test drive what you want to achieve in the next level, whether it be a trial to an upgraded software or physically test driving your dream car, you should feel a little bit nervous. If you’re not nervous to do it, you’re not doing it right. For example, I have an income goal for the year, and if I meet it, I plan to buy myself a Cartier Love bracelet as a reward. With my husband’s encouragement, we walked into a Cartier store where I tried on an $8,000 bracelet. After I tried it on, we told the cashier, “Not today, but thank you.” Now I know what size to order when I do reach that goal, and I even know what it looks and feels like on my wrist, which is surely going to help me attain it. I test drove (aka demonstrated) my future reward to help realize it. It doesn’t matter what income level you reach, it doesn’t matter how many profit breakthroughs you have, there’s always room for money mindset improvement. One of my favorite questions to ask is: What’s a rich car to you? The answer is different for everyone. Some people might want to buy a tricked-out Ford truck, while others would feel so rich if they had a brand new Kia, and some people are going to say Lamborghini. Mine has always been a Mercedes Benz. When I was growing up, my best friend drove her mother’s Mercedes Benz, and I thought it was the nicest car I’d ever seen. I imagine sitting down at the wheel of my own Mercedes Benz with its beautiful emblem on it, and when I do, I’ll know I’ve made it. My next step, and the one that scares me the most, is to go test drive a Mercedes Benz. While it scares me a lot and intimidates me even more than that, it’s something that I have to do. Luxury cars are not a high priority for me. I would only buy that car as an extra, and that makes it extravagant. When I test drive it, it’s not about the car at all, it’s about test driving extravagance. I invite you to go do the same, and test drive your reward. You’ll fill your plate too full, you’ll give more than is necessary of your time and energy, and you’ll overcompensate at once. This is nobody’s fault but your own, and it’s completely normal. It’s the mindset to beat. As I mentioned earlier, this is not about doing more to earn more. This step is an act of pruning. Just as you prune a tree so that it will be more fruitful (and its energy not spread too thin), you must prune the have-tos, time-wasters, and busywork from your day. The more must-dos you do, the better off you’ll fare. When you trim back all the extra that you’re doing, it’s going to feel scary, and that’s okay. You’ll have an urge to overcompensate and prove your worthy. See that trigger for what it is: A sign you’re moving in the right direction. During the live broadcast of this material on the Marketing Creativity Facebook page, I took questions from those in attendance. Follow along there to join us live next time! Petra said: I must be the only one who doesn’t care about material things. Nope, that’s completely normal, too. My first goals were purely experiences. Once I started having more travel in my life, and thereby experienced more luxury situations and ways of feeling, I looked around and thought of things that would add more value to my everyday life—things that would make me feel the same ways that travel did, luxurious, rich, and taken care of. It’s not about the materialistic things whatsoever. (That’s actually one of the limiting beliefs I’ll cover in the upcoming course.) It’s not about getting more cars or jewelry, or anything like that. It’s about the feelings certain things generate. There’s personal power in waking up every day and feeling a burst of, “I’m taken care of, I’m completely nurtured, I get paid very well for what I do because I’m very good at it.” That’s not materialistic at all. Jane asked: How do you time manage? Eliminate have-tos—that long list of things you think you “should be” doing. Have-tos are the things that keep you busy, and busy drains time and energy. Every day, I put me first. I study self-improvement material every morning. I make my bed and tidy my space. My work outs are on the schedule first. The work I must-do is prioritized. Extreme self-care allows me to better care for my family, my clients, and the community. If I can’t take care of myself properly, I won’t have anything to give. This year, I’ll spend a lot less time blogging—writing for writing’s sake, just to get something new up on the site. I’ll spend less time taking pictures of my work and more time delivering it, less time on Instagram. I check emails infrequently, and overall, I do a lot less of that busy stuff. As a result, I find myself just very calm and comfortable. I have more faith that everything is working out for the best—this is new for me, and I really love it. I’m putting myself first, letting have-tos wait, and I don’t allow myself to be a dumping ground of other people’s priorities and expectations. A powerful woman knows her own priorities and puts them first. She says “no” a lot, and that’s a great time manager. If you want to clean out the clutter in your “time closet,” empty your entire schedule, and then decide what you want to put back. Ask: Does this activity bring me joy? That’s my best advice, thank you for a great question. Jenna asked: Do you have a morning routine that works for you? I wake up to zero digital distractions or notifications—not even an alarm on my phone. I use a wake-up light. I won’t check email until much later in the day. I start with a self-improvement text or course, right now I’m working on Claim Your Power. This gets my mind on track for the day. I sometimes follow that with brainwave meditation. I put everything down at 7 AM to be present with my family for a full hour, again without digital distraction. My phone even stays on its charger in my bedroom. After sending my children to school, I set a timer and start my powerblocks (60-90 minutes of focused production on a specific project). Two days of the week, I work out from home in the morning. The workouts are so hard, but this break from work is a real treat. I love exercising in the morning because the path of least resistance in the evening is to turn on the TV or computer and check-out. It’s easy to put off self-care because it takes willpower (which is often spent toward the end of the day), so it’s wonderful when you can get it in first. Andra said: Every time I make real steps forward and I feel like I can get what I want, I freak out and pull back. What can I do to stop this process? Barbara Stanny says, “When you commit to greatness, everything unlike itself, will come up to healed.” That’s a great explanation of what happens during a Divine Storm. A few months before I hit my first six-figure Profit Breakthrough, everything in my life fell apart. Both cars broke down, one of my sons got sick for an entire month. Bills surfaced out of nowhere—some as big as $1,000! Our heating unit stopped working and needed replaced. Every challenge is a chance to respond in a new way. It’s an opportunity to trust that this can be quickly and easily resolved. React differently than you normally would. Show life that you’re learning its lessons with grace. Right before a breakthrough, most things look bleak. All things that are out of alignment will come up to be healed. I get chills when the chaos appears because I know better is coming. It’s so easy to get frustrated, but my husband and I remind each other: Thank every frustration for surfacing itself, for allowing it to work itself out quickly and easily, and for clearing the way. We change the way we respond and trust that greatness is healing all that’s out of alignment. The greatness you’ve been asking for is trying to break through. When junky stuff comes up for you, get excited! Better is on the way. I hope you’ve found these 7 steps to a healthier, wealthier YOU useful. Be sure to subscribe to my email list below for private lessons, live calls, and exclusive offers. Here’s to your most profitable year. Very good. I went through the Dave Ramsey course after I lost my job, our home, our car. And it put us on the right track quickly. I still use it, and now have a larger life than I thought possible. Several of your steps made me stop and think. I’ll be working on the decluttering space and mind. Wow!!! This post is very much interesting to read. Thanks for those great suggestions. Please keep me on your email list! Great post! There are so many things to do, but prioritization is definitely important. It’s also why I’ll try to everyday create a list where i segregate items into Urgent, Important and Can Be Done. I’m still looking for ways on how I can really profit from my website and what possibilities of income I can get through it – but this post really helps! Thanks, Lisa!